클로스트리디움 디피실 감염증( -感染症, Clostridium difficile infection, CDI)은 클로스트리디움 디피실로 인하여 증상을 보이는 감염증이다. 항생제 관련 가막성 대장염(antibiotic associated pseudomembranous colitis), 클로스트리디움 디피실 관련 질병(CDAD, 즉 C. difficile associated diarrhea), 가막성 대장염(pseudomembranous colitis)과 동의어이다. 증상에는 설사, 발열, 메스꺼움, 복통을 포함한다. 항생제 관련 설사병 가운데 약 20%를 이룬다. 합병증에는 가막성 대장염(pseudomembranous colitis), 중독성거대결장, 위장관 천공, 패혈증을 포함할 수 있다. 클로스트리디움 디피실이 어떻게 확산되는지를 설명한 그림. 클로스트리디움 디피실 세균에 의한 감염은 클로스트리디움 디피실 설사병을 일으킨다. 클로스트리디움 디피실이 전달될 때 증상이 없는 것이 일반적이다. 증상이 없는 사람에 대한 치료는 논란의 여지가 있다. 일반적으로 그 정도가 약한 경우 특정한 치료 방법을 요하지는 않는다. 설사와 관련된 탈수를 치료할 때에는 경구 수분 보충 요법이 유용하다. ↑ Butler, M; Olson, A; Drekonja, D; Shaukat, A; Schwehr, N; Shippee, N; Wilt, TJ (March 2016). “Early Diagnosis, Prevention, and Treatment of Clostridium difficile: Update”. 《AHRQ Comparative Effectiveness Reviews.》: vi,1. PMID 27148613. 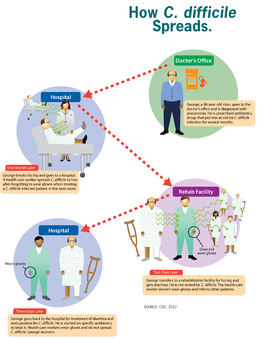 ↑ “Frequently Asked Questions about Clostridium difficile for Healthcare Providers”. 《CDC》. 2012년 3월 6일. 2016년 9월 5일에 확인함. ↑ Ryan KJ, Ray CG (editors) (2004). 《Sherris Medical Microbiology》 4판. McGraw Hill. 322–4쪽. ISBN 0-8385-8529-9. ↑ Nelson RL, Kelsey P, Leeman H, Meardon N, Patel H, Paul K, Rees R, Taylor B, Wood E, Malakun R (2011년 9월 7일). “Antibiotic treatment for Clostridium difficile-associated diarrhea in adults.”. 《The Cochrane Database of Systematic Reviews》 (9): CD004610. PMID 21901692. doi:10.1002/14651858.CD004610.pub4. 이 문서는 2018년 9월 16일 (일) 07:15에 마지막으로 편집되었습니다.